While the rest of the world reels from the shock of recent Islamist terror attacks in Germany and France, our ruling elite and media seem to be in a state of denial, if not fear, of being labelled "Islamophobic." The talking heads that feed our 24/7 news appetite on networks like CNN and the BBC best illustrate this condition. The clearest example of such unnecessary caution was displayed following the July 22 Munich terror attack in which the gunman, David Ali Sonboly, committed suicide. Among the first eyewitnesses who saw Sonboly in close quarters before he began his rampage, was a Muslim woman who spoke to CNN: "My son saw a man in the toilet loading a gun. It was a pistol .... I hear "Allah O Akbar. Allah O Akbar." This I know because I am Muslim. I hear this and I only cry." Despite a clear statement identifying the shooter as a Muslim, CNN's hosts and commentators refused to give any credence to the women's account. There was even speculation the terrorist was a right-wing German extremist. Tom Fuentes, former FBI assistant director, effectively questioned the woman's account by saying, "Whether it's Islamic terrorism or whether its right-wing terrorism designed to cause a backlash against Islamic people in Germany, and that's a possibility as well." Truth, common sense, and courage have committed collective harakiri in media coverage of Islamist terror. Michael Weiss, the respected author of ISIS: Inside the Army of Terror, shrugged off the "Allah O Akbar" clue, saying: "The alleged shooter describes himself as being a German... I'll be honest with you, I am tending a little bit more away from ISIS at this point," he said. Watching this exchange, I felt I was in some parallel universe, where truth, common sense, and courage had committed collective harakiri. My wife, amused at my exasperation, reminded me of Matthew 15:14 in the Bible: "So ignore them. They are blind guides leading the blind, and if one blind person guides another, they will both fall into a ditch." As if the German right-wing theory being pushed by the talking heads were not enough, CNN's "terrorism analyst" Paul Cruickshank's comment made me shut off the TV set. He predicted, "We don't actually even know it's terrorism in the sense of an attack with a political motive at this point" and later added "this may not end up being a terrorist attack at all." An hour later, when I reluctantly came back to hear the latest from Munich, CNN's justice correspondent Evan Perez set the seal by making the following pronouncement: "It's the fifth anniversary of the attack in Norway in which a right-wing attacker blew up a bomb at the parliament and then went after a youth conference." Crack reporting from the BBC. In the meantime, the clip of the Muslim woman who heard the "Allah O Akbar" giveaway chant, seemed to disappear from subsequent broadcasts. Soon, Norway, Breivik and the German right-wing extremists were being touted as the villains. The inability to utter the words "Muslim" or "Islamic" was also reflected in the subsequent attacks this week. 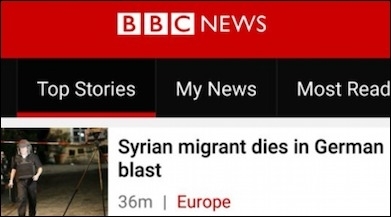 On July 25, when an ISIS Syrian-born suicide bomber blew himself up outside a music festival in Bavaria, the BBC headline (subsequently changed) read: "Syrian migrant dies in German blast." The politically blind are indeed leading us. Fortunately the rest of us can see through this cowardice.